It would be an understatement to say that I’m no stranger to illness. Both myself and the rest of my family has struggled with serious illnesses that have impacted our lives in inexplicable ways. I’ll also admit to being someone who occasionally allows disease to drag me down, depress me and all around get the better of me. But those days are few compared to the days where I challenge anything that comes my way, determined to learn every possible lesson from each life experience. After my summer diagnosis with Grave’s Disease, I sort of felt I had already conquered the necessary health hurdle for the year. However, right now, I’m waiting on some test results as my doctor fears I might also have diabetes. Hmm. Not the way I wanted to start out 2012. With potential for another life-altering disease, I’ve turned to my typical method of coping: I read. So when I was handed a book that helped explain my current health problems, I couldn’t wait to tell readers all of the Yoga Flavored Life readers all about it. 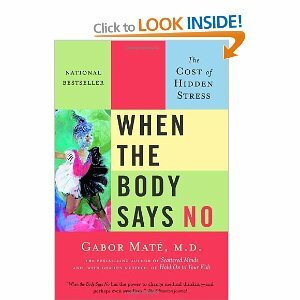 “When the Body Says No” is written by Dr. Gabor Maté and details the documented connection between disease and our emotions and stress. On more than one occasion, I’ve described myself as an extremely stressed out individual, which is why yoga is such a vital part of my life. It doesn’t help that I’ve had a considerable number of health challenges, which contribute to my stress levels, and according to Dr. Maté, only increases my risk for further disease. This book seems to discuss the proverbial “chicken or egg first” question. Does stress cause disease or is disease the stress-inducer? Initially, I’ll admit to being full of skepticism about this book. I would say that when it comes to illnesses, I like to be informed, but I don’t wish to be hit over the head with all the things that I’m “doing wrong” or “eating wrong,” mostly because to an extent, I feel like is just too short to operate in constant fear. I also feel that many of these kinds of books manipulate statistics into getting across their message, even if the results of certain studies weren’t at all meant to be bent to suit. This isn’t to say, of course, that I think that a diet consisting solely of fast food and potato chips is at all healthy, but I don’t think that a bi-monthly serving of ice cream will be the death of me either. So faced with a book that pointed to my well-acquainted issue of stress, I was nervous to read it. I was nervous because I knew it would appropriately outline all the ways in which stress is negatively impacting my body. One of the best things I can say about “When the Body Says No” is that it doesn’t preach and it doesn’t bend scientists’ words into something completely unintended. Instead, Dr. Maté points readers to facts, studies that he in particular has researched and studied, and fact-based conclusions on stress and the impact it has on our mental and physical health. He even goes into details about our childhood stress coping mechanisms can affect the way we manage stress in the future, lending to the nature vs. nurture concept in relation to disease. All this to say, I’m now even more sure that stress, and the ways in which I cope with stress, is negatively affecting my health. So if you’ve been wondering how to keep major disease at bay, keep up your yoga practice. Breathe deeply, enjoy each day, meditate, speak to counselors or therapists about anxiety and stress, read books, and pursue your passions. And always look to family history, to find ways to prevent history from repeating itself.